HubSpot has signed an agreement to lease all of the office accommodation in No. 1 Sir John Rogerson’s Quay, Dublin 2, an iconic HQ building in the heart of the Dublin Docklands. The new space accounts for approximately 112,000 sq. 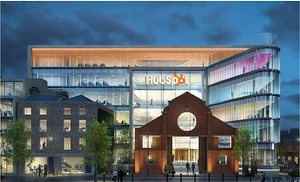 ft., bringing HubSpot’s total footprint in Dublin to 185,000 sq. ft. when combined with its existing space in One and Two Dockland Central. The new space will house more than 800 seats and will feature top-class amenities that come standard with all of our global offices, including convertible standing desks, video-equipped conference rooms, and plenty of collaboration spaces and nomad desks. Combined with our existing space in One and Two Dockland Central, the new office will give us enough space to accommodate up to 1,400 seats, giving us plenty of room to continue to grow our workforce in the region. HubSpot was recently recognized for its ongoing commitment to excellence in workplace development, innovation, and design at the Irish national Fit Out Awards. We overcame stiff competition to be named Fit Out Client of the Year at the awards ceremony, which was held in Dublin’s Convention Centre in November. The company was also named Best Workplace by Great Place to Work Ireland earlier this year.